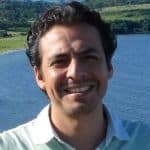 Juan Guardado leads Grameen Foundation’s Kenya and Uganda country operations. He directly oversees innovation projects in the agricultural and financial services sectors being implemented in partnership with leading national and multi-national institutions, with a particular focus on mobile technology-enabled operations. Prior to joining the foundation, he was deputy CEO at Equity for Tanzania Ltd, a lease financing institution focused on micro and small enterprises, and co-founded Natural Extracts Industries Ltd, a social enterprise pioneering the production of natural flavours in Tanzania. Before that, he spent five years in McKinsey & Company’s Business Technology Office in London, focused on health technology. He started his career developing patented graphics rendering technologies at Matrox Graphics Inc (Canada) and Nvidia Corp (USA and UK). He holds a B.Eng. from McGill University and an MBA from INSEAD. The African continent is at the forefront of the mobile revolution, with nearly 700 million mobile phone accounts — more than in the U.S. and Europe combined. Africa has also become the world leader in mobile banking. But mobile phones and even mobile money accounts do not amount to digital financial inclusion.